A traumatic brain injury (TBI) can have a devastating effect on your life and on your family. It can ruin your finances, put enormous stress on your loved ones and leave you with permanent disabilities. The life-long physical, emotional and financial effects can be overwhelming. Insurance companies will try to avoid their responsibilities and pay the lowest possible amount for your treatment and losses. You need legal representation with a vast knowledge of personal injury law to look out for your best interests. At the Law Offices of James O. Cunningham, P.A., we will work tirelessly for you and your future. Since your brain controls thinking, emotions, language and behavior, a TBI can be a life-changing event. Many sufferers of traumatic brain injury have permanent memory loss, personality changes and other debilitating and lasting effects. These types of cognitive effects are often more disabling than the physical effects are. Memory loss, or amnesia, is a common effect of head trauma. Sufferers forget what happened immediately before or after the injury occurred. They may then have ongoing cognitive difficulties, an unclear thought process and trouble remembering small, but important, things. The types of things often forgotten are the things that make independent living possible. A person who has suffered a traumatic brain injury may have difficulty remembering the steps to make toast, or take a shower. Traumatic brain injury can cause permanent personality changes. A person may not be able to respond with the appropriate emotion to situations or conversations. Brain injury can amplify some personality traits, or cause a seeming complete personality reversal. A person who was previously very laid back may be on edge after a traumatic brain injury. This can be very difficult for family or loved ones caring for a person with a brain injury. While a concussion is a mild form of traumatic brain injury, post concussive syndrome can last for months after the incident. Post concussive syndrome can cause headaches, dizziness, difficulty concentrating, irritability and sensitivity to stimuli such as light and noise. 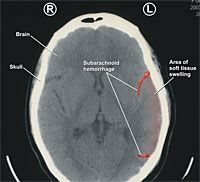 Traumatic brain injuries vary from mild, for example, a concussion, to severe such as a subdural hematoma. Neuropsychological testing can determine the extent of injury after a head trauma. The tests assess mental clarity, language ability, memory and coordination. If you have suffered a traumatic brain injury, you need a personal injury lawyer with the proven ability to fight for your legal rights. Do not let the financial burden of this serious injury lead to more suffering than you are already experiencing. Let us stand up for you while you contend with the difficult process of healing and learning to live with the permanent effects of a TBI. Call us today at 407-425-2000 or toll free at 877-FL-INJURY for a free evaluation of your case.